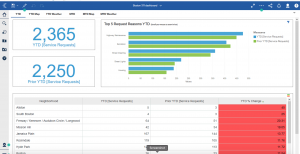 Recently, IBM released Cognos Analytics 11.1. I have been using it now for a few weeks and I must say that I'm impressed with some of the new features and enhancements. There are many new items in Cognos Analytics 11.1, too many to cover in one blog. As such, I'm going to cover some of my favorites. The first thing you will see when you log into IBM Passport Advantage to download the CA 11.1 software is there are 3 main install files plus some other installers for Office and other items. The 3 main files are the main installer, client installer and the server installer. The client installer contains Framework Manager, Life-Cycle Manager, Cube Designer and Dynamic Query Analyzer. The server install contains the dispatcher, content manager and gateway. The software development kit comes pre installed with this installs. Last item of note, you still have the easy install option that was introduced with Cognos Analytics. You can now upload multi tab spreadsheets. The system will generate a new table for each. Append and replace options available for altering existing files. This new feature makes it easy to create as of dates and comparisons to dates in time. The sample data comes with pre package calendars (calendar year and fiscal year that you can alter for your specific fiscal year). The options include but no limited to month to date, quarter to date and year to date calculations made easy. In short, the new exploration feature allows you a flexible workspace to explore data and gain insight through Watson like artificial intelligence. The system will take your data and automatically generate coorelated insights, details and suggested related visualizations. Details - text is generated to provide insight that may not be see by just looking at the data. Related Visualizations - the system recommends related visualizations that are related to what you are currently looking at. Based on the data analysis, these related visualizations might be of interest to you. Correlated Insights - If one of the data items in a visualization is determined by the system to be a “target”, correlated insights indicate that the system has identified “drivers”. Correlated insights are displayed as green ovals with a number. Copy and Paste - You can use ctrl c and ctrl v to copy and past visualizations from dashboard to dashboard and keep the data points behind the visualizations. Relative or Absolute Visualization Layout on the Dashbaord Canvas. Page Size - you can now set the page size such as letter or legal. 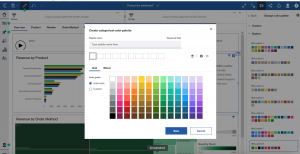 Custom Color Pallets - You can create your own custom color pallets and save them for use across the organization. Widget Title Formatting - you can modify the font, size, color and style. Axis Labels - customize the axis labels, scale, titles and orientation. Number of New and Updated Visualizations. 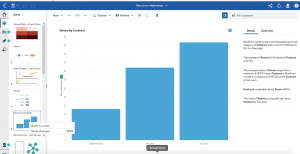 Reporting has seen a number of enhancements in Cognos Analytics 11.1. Guided Report Layout - You can now place items on the reporting canvas with visual guidelines. New Navigation Interface - you can now easily switch between pages and queries with the new navigation menu. Many of the visualizations in Dashboards are now available in Reporting. The data module area has been in Cognos Analytics 11.1. is significantly changed, and new modeling capabilities are introduced. Improved Source Selection - You can use search and filtering options to locate different source types in Team content, My content, and Recent folders. Add additional tables manually or allow the system to suggest tables. Multifunctional, robust expression editor - redesigned interface for creating and editing tables, filters, and calculations. A few collaboration items have been added to Cognos Analytics 11.1 They include share through Slack, linking to Cognos Analytics content and exporting via PDF for dashboards.